The Nexus 7 Tablet doesn’t come with a camera app or a rear facing camera. There is a front facing camera but there isn’t much use without the ability to record HD video. A clever tweak discovered by hillbeast of xdadevelopers enables the camera app and 720p video recording on the front facing camera. This mod works on any stock ROM. However, if you’re using a CyanogenMod-based ROM, you don’t need to flash this mod because the developer has pushed the patch to CyanogenMod’s repositories and will already be on your tablet. 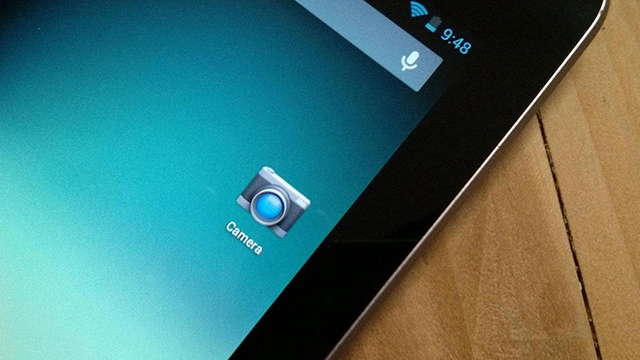 This guide shows you how to enable 720p video recording on the Nexus 7. The instructions in this guide are intended for use with the Asus Nexus 7. Applying these instructions on another device or model may produce undesired outcomes. Asus Nexus 7 with root access and ClockworkMod Recovery installed. For help, you can check out a guide – how to root and flash ClockworkMod Recovery on the Nexus 7. Backup all personal data on your tablet to make sure you have a copy of your personal data (e.g., contacts, SMS, MMS, Internet settings, Wi-Fi passwords, and the like) in case the procedure in this guide erases such data. Copy the mod’s ZIP file to your tablet’s internal SD card. Boot the tablet into Fastboot Mode. To do that, press the Volume Up, Volume Down, and the Power buttons until Fastboot Mode boots. Select Recovery to boot into ClockworkMod Recovery. Create a NANDroid backup of your current ROM. Select Backup and Restore > Backup. Select Install ZIP from SD Card > Choose ZIP from SD Card > select the MOD file > Yes. Congratulations! You can now take and record 720p videos using your Nexus 7′s front camera.